Sarah Fortune with a full cod end. Sarah Fortune, a graduate student at the University of British Columbia (UBC) was testing her plankton net a few days ago and I thought that it would be fun to describe the process. 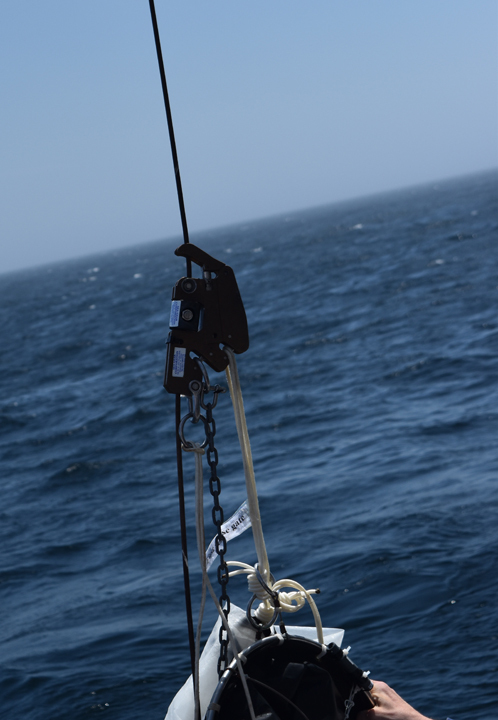 A plankton net is hoisted overboard on a similar winch and winch cable as the CTD and is used to collect samples of plankton from the ocean. A single plankton net has a large hoop at the opening, about 50 cm in diameter that then tapers down to a collection container, called a cod end, at the other end. 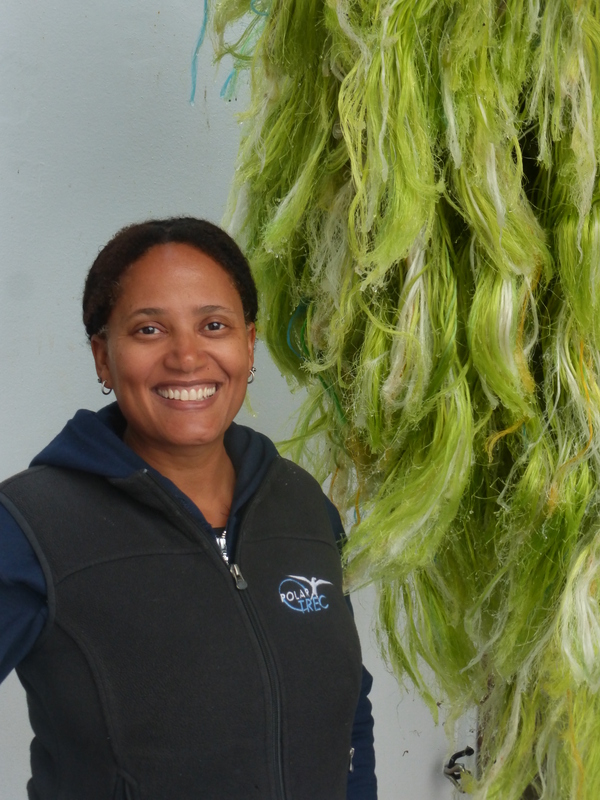 The plankton net is a little over 3 meters long. Many plankton nets are actually paired side by side and commonly referred to as “bongo” nets for due to the two hoops looking like bongo drums. The mesh of the net is made of nylon and can vary in mesh size. This particular net has a mesh of 330 microns or a third of a millimeter. 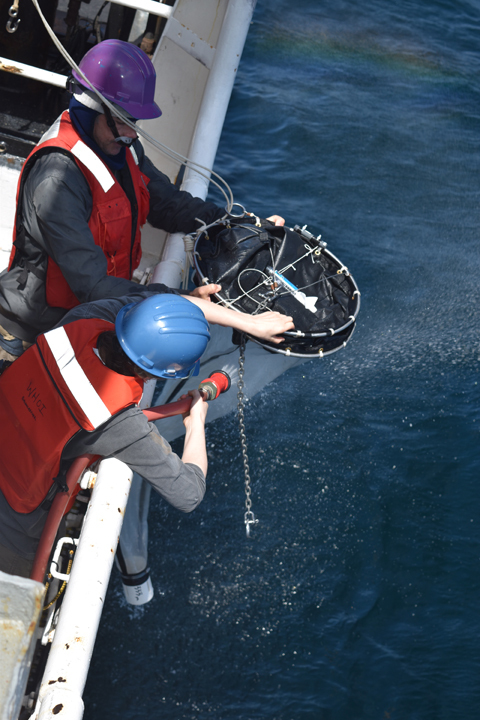 This allows researchers to capture very small plankton (millimeter sized). Plankton net fully extended after being down at about a depth of 150 meters. 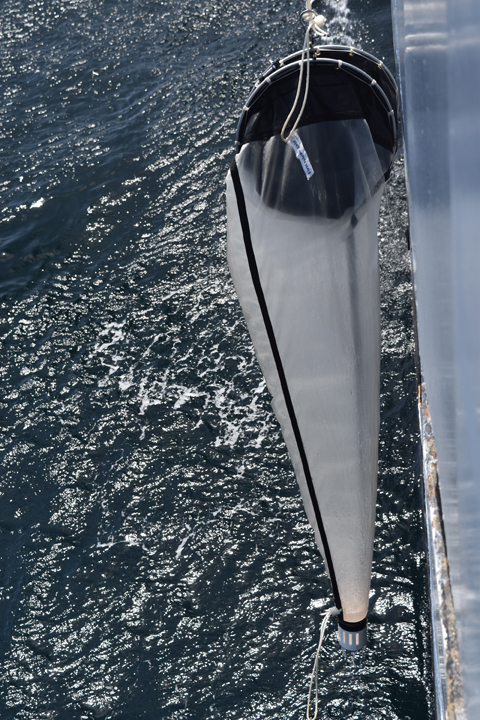 Trip mechanism used to open and close the plankton net. 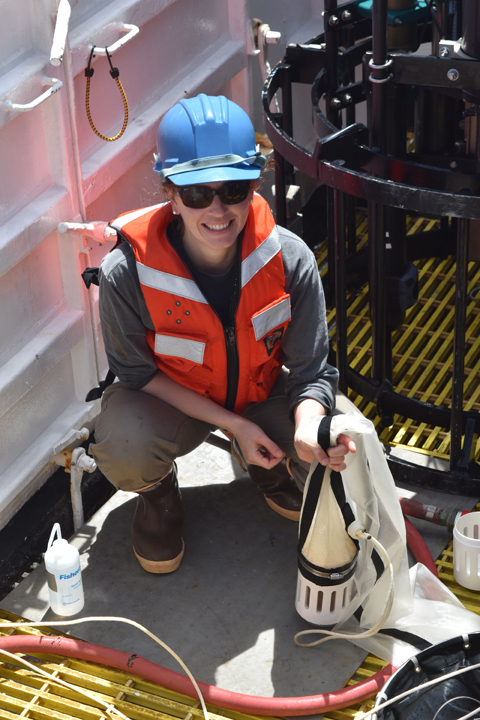 The plankton net that Sarah will be using for her research on bowhead whales is designed to open and close at specific depths using a special clasp, called a double trip mechanism. 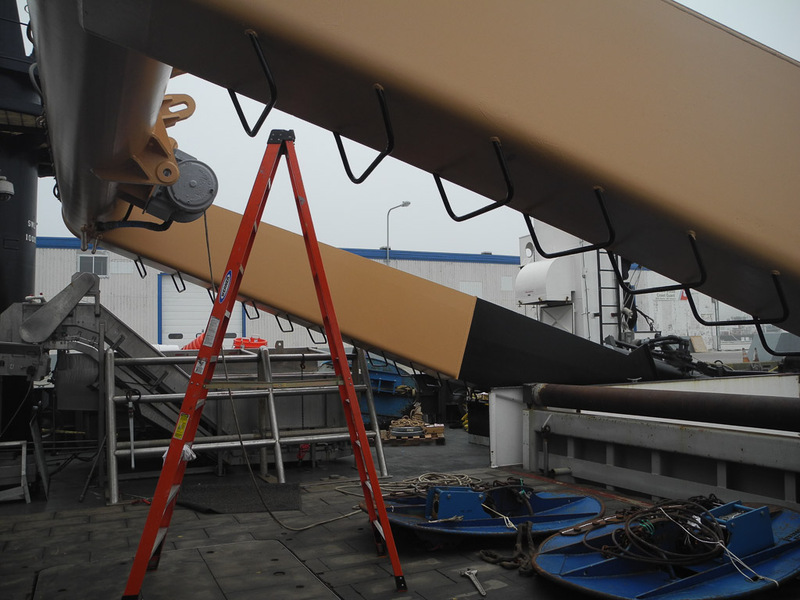 A rolled up net is lowered to the target depth, a weight is sent down the winch cable and opens the double trip mechansim and the net. 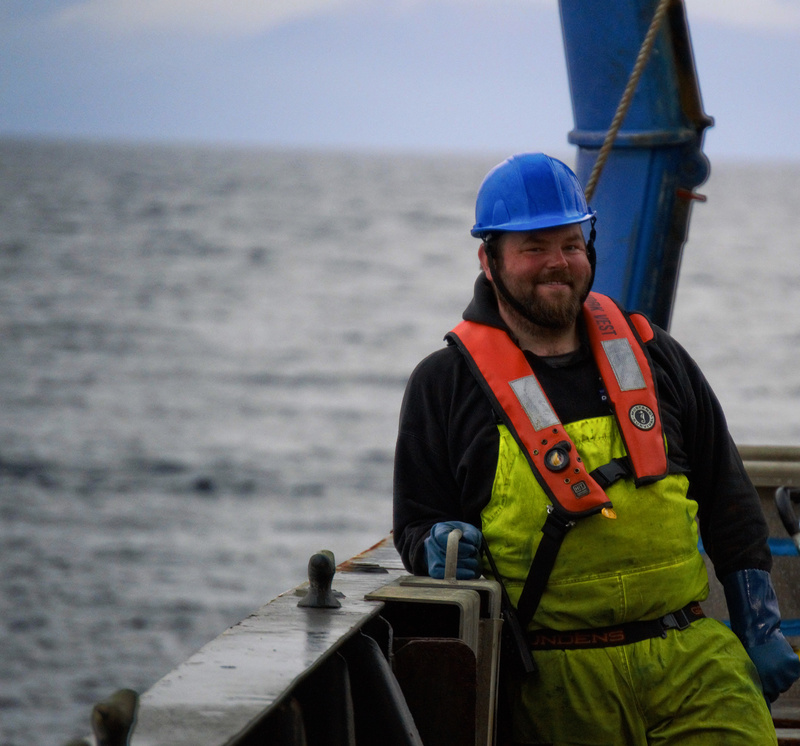 As the boat moves, ever so slightly, organisms are collected in the net. The net is then brought back to the surface using the winch and then closed again with a weight at another target depth. I gathered that the double trip mechanism was a bit finicky, so Sarah was practicing the technique. Washing down the plankton net. Once the net was out of the water, it was washed down with a hose to make sure that all of the organisms were in the cod end. Further washing occurred on deck. 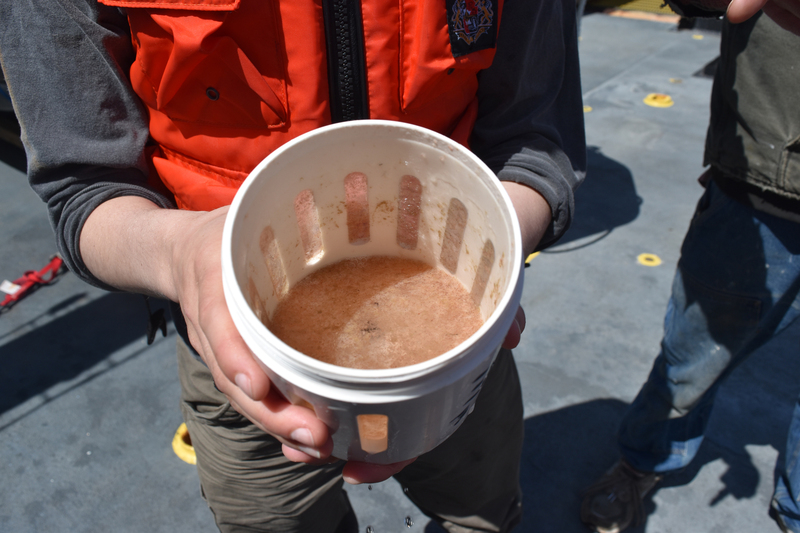 The cod end also contains mesh in spots, so the excess water flushes out and the organisms are left in the container (the cod end). If there is a lot of excess water and organisms these are dumped into a bucket and then brought up to the wet lab to be processed. 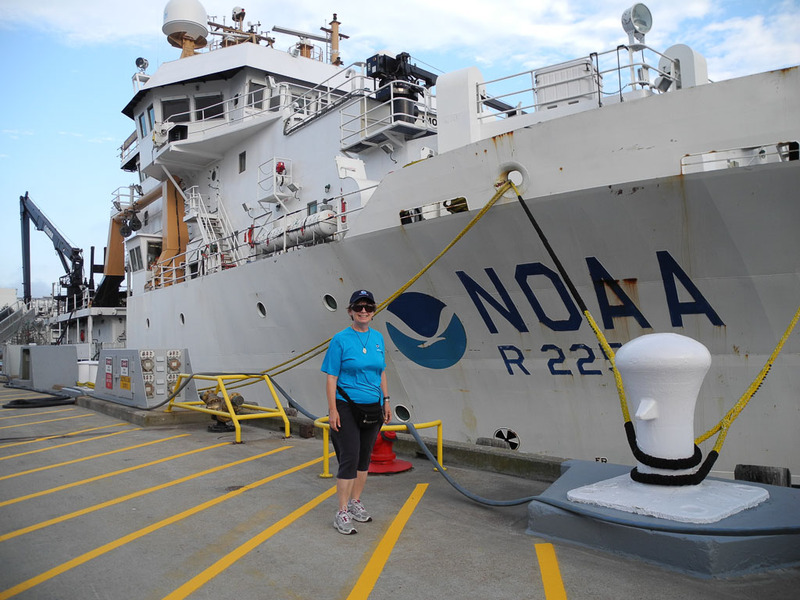 A subset of the sample was poured into a test tube, via a funnel, and put in a freezer for further examination off the ship. 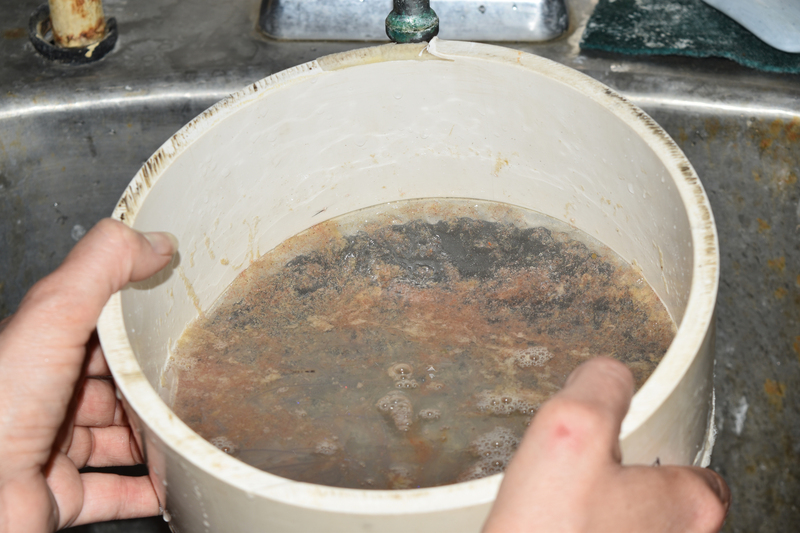 If there is excess water, the sample is poured through a mesh sieve to remove the excess water. Other samples were also saved in beakers. Cod end with lots of Calinus finmarchicus. Collection being sieved. The red coloring of the sample comes from Calinus finmarchicus. There are also some clear jellyfish in there, but they are difficult to see. Sarah also had a stereoscopic microscope along to examine the catch, though this is a somewhat difficult task as the specimens move around a lot with the ship’s motion. The target specimen was Calanus finmarchicus, the primary food of the North Atlantic Right Whale. These are incredibly tiny organisms, typically ranging in size from 2-4 millimeters. At one point Dr. Baumgartner had one on his finger and even that was difficult to see except for the red pigment. He also related to us onlookers an interesting analogy of how much an individual right whale would need to consume in one day. Basically, every right whale needs to eat the weight of a Volkswagen Beetle of Calanus finmarchicus every day. That is a lot of very small organisms. 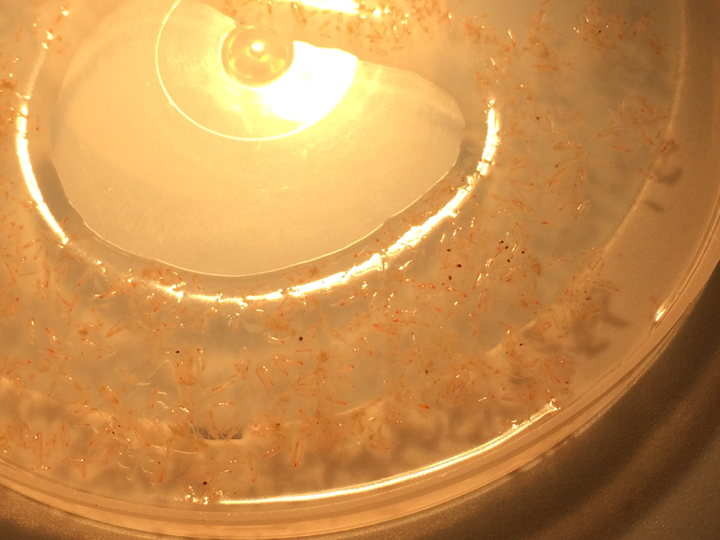 Some other interesting organisms that were captured in the plankton net over the day included microscopic starfish, jellyfish, krill, and a fish (which was thrown back into the ocean). View of sample using the light of the microscope. The red organisms with out black eyes are Calinus finmarchicus. The organisms with two black eyes are krill. In past few days we have encountered patches of thick fog that in some cases have lasted for hours. 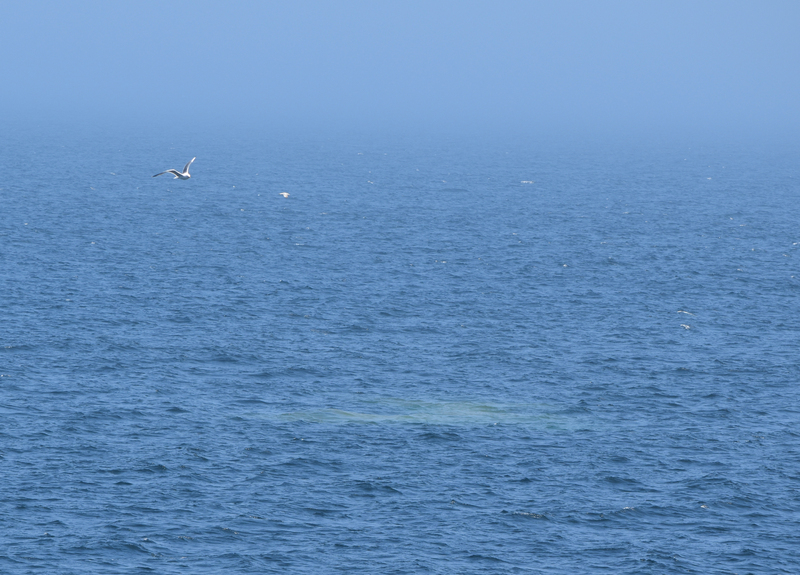 This has hampered our whale observations, one because we cannot see them in the fog, and two we cannot stand up on the fly bridge (above the bridge) when the fog horn is on (very loud). 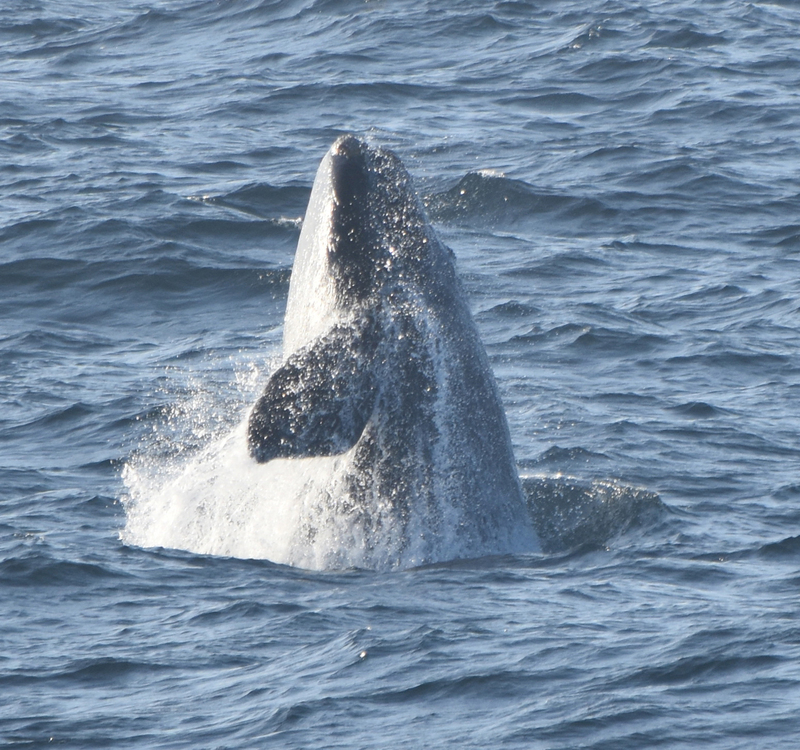 So, our sighting numbers are significantly down, with a whole day in which we did not see a single whale of any kind. 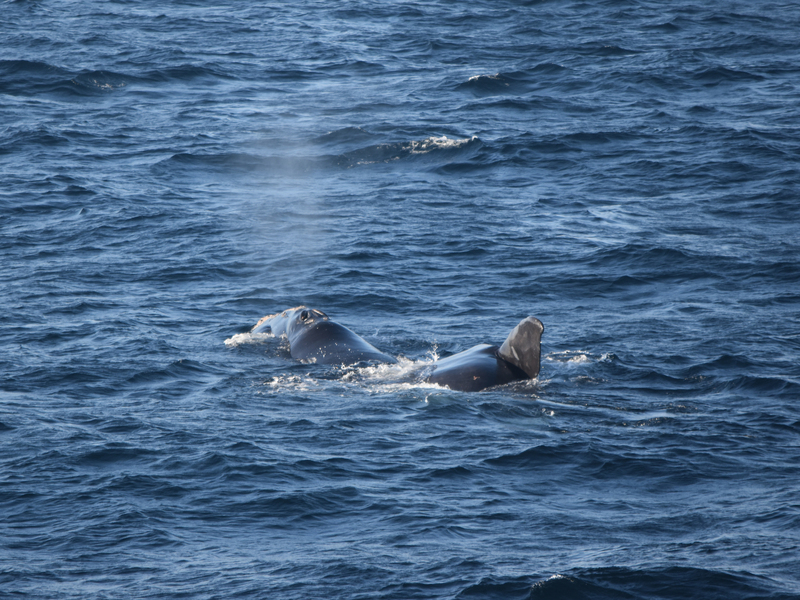 One evening, though, we had a really good show from a mother and calf North Atlantic right whale. We have seen these two before on two occasions. The mother is 1950. Her calf was up near the surface for nearly an hour shaking its fluke and flippers, breaching, and rolling onto its back. The calf also rolled all over the mom when she was at the surface. 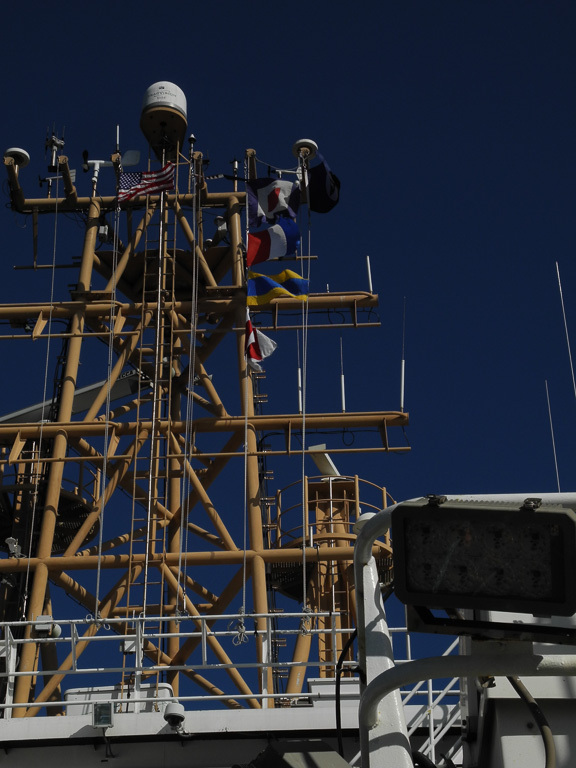 This all occurred very close to the ship so everyone on the fly bridge and the bridge was able to watch and see the action pretty clearly. I was able to capture several photographs and tried a few videos with my camera. It is not very easy to shoot videos on a boat that is rocking up and down, but I think they turned out okay. 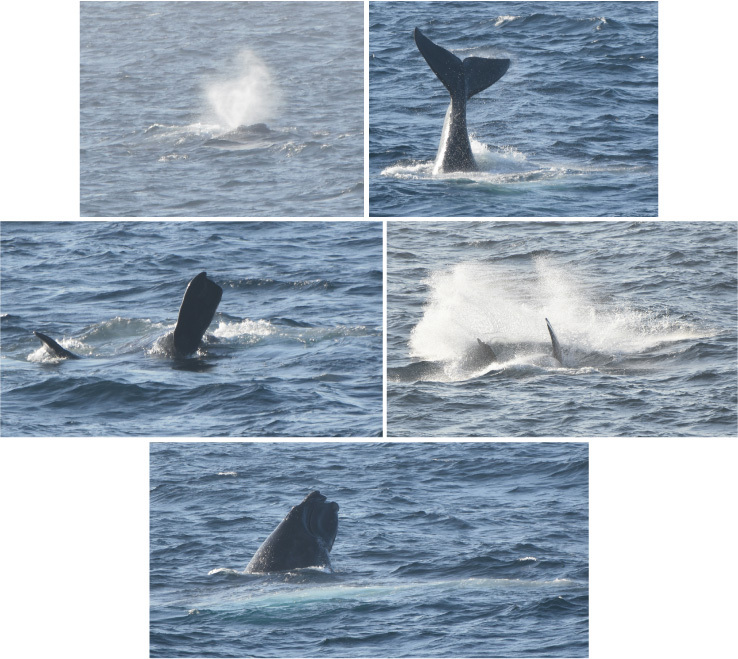 Various images of right whale calf: “V” shaped blow, characteristics of right whales (upper left), fluke (upper right), calf swimming on its back with flippers flapping (middle row), and a head shot (bottom row). Images collected under MMPA research permit #17355. These photos are cropped images of photographs taken with a telephoto lens. Right whale calf breaching. Images collected under MMPA research permit #17355. These photos are cropped images of photographs taken with a telephoto lens. Right whale calf rolling over the back of its mom, 1950. Notice the callosities pattern on the mom and the two blow holes. Images collected under MMPA research permit #17355. These photos are cropped images of photographs taken with a telephoto lens. Only a few more days on the ship. 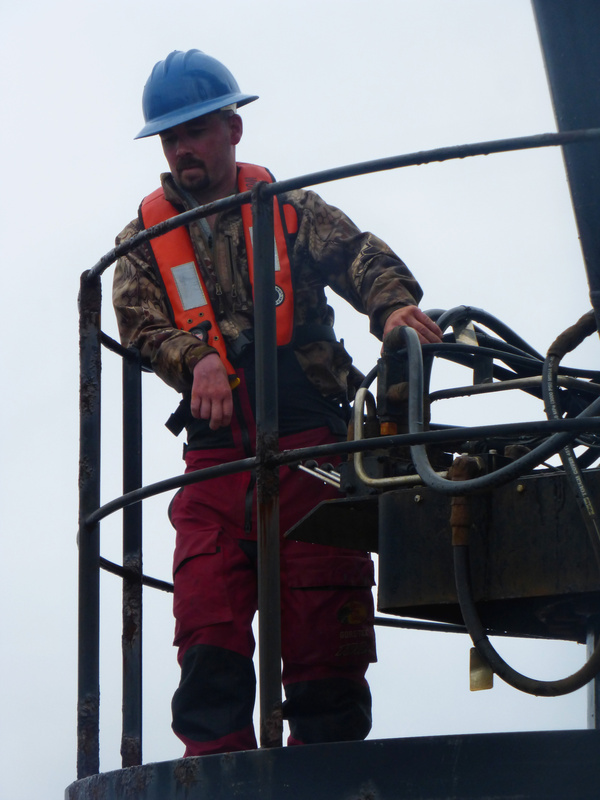 Unfortunately with the fog and the lack of right whale sightings the scientists have not necessarily accomplished all of their objectives, including testing out a new tag that could be used to track a whale for several days. 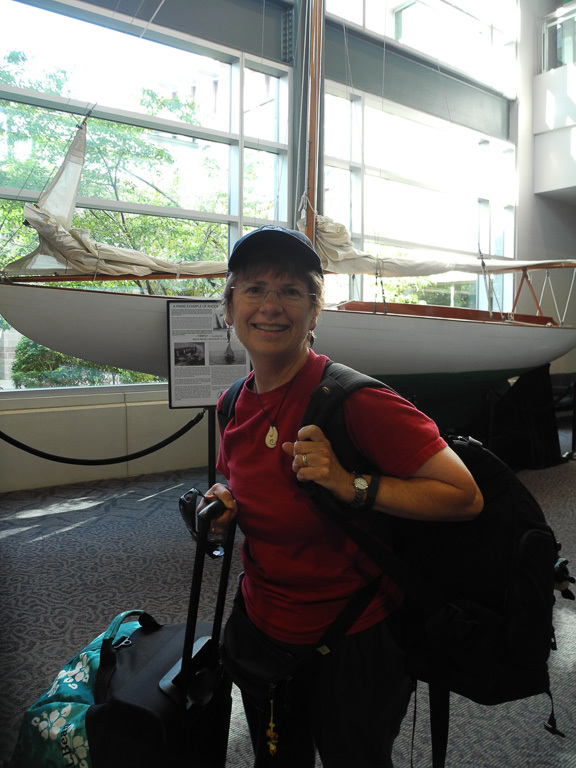 We come into port early Friday, June 5th. 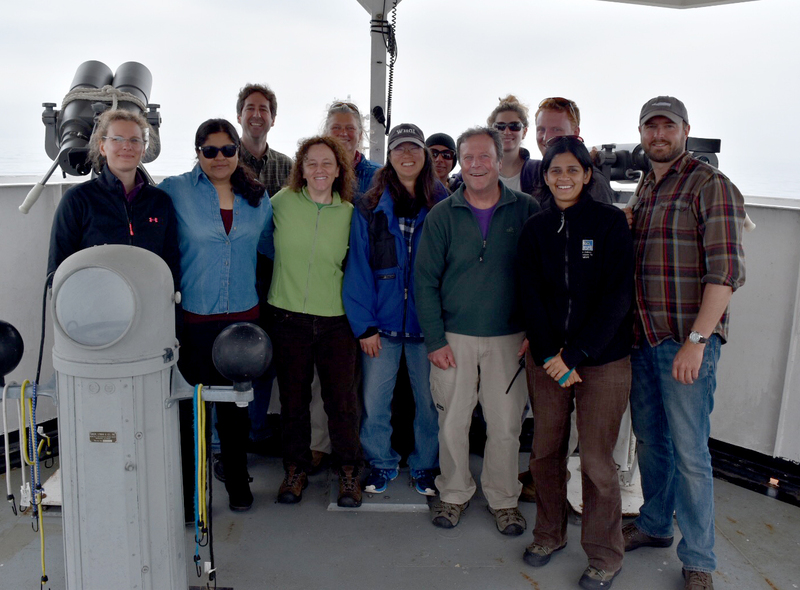 Group shot of the scientists on board (minus Eric Matzen who was only on for the first leg). Back row from left to right: Mark Baumgartner, Lisa (Grace) Conger, Corey Accardo, Sarah Fortune, and Hansen Johnson. Front row from left to right: Kelly Dilliard (me), Sabena Siddiqui, Jenn Gatzke, Suzanne Yin, Peter Duley (chief scientist), Divya Panicker, and Chris Tremblay. Whale poop (strangely colored area) from a fin whale. Images collected under MMPA research permit #17355. These photos are cropped images of photographs taken with a telephoto lens.